The former kingdom of Arnor, or the Northern Kingdom, was a kingdom of the Dúnedain in the land of Eriador in Middle-earth. The name probably means "Land of the King", from Sindarin Ara- (high, kingly) + (n)dor (land). At its greatest, Arnor encompassed almost the whole region of Eriador between Bruinen, Gwathló and Lhûn, and the region which would later be known as the Shire. Arnor's population was composed by Dúnedain in western-central regions and mixed or indigenous (and reluctant as citizens) peoples. Its former capital was Annúminas near the lake Nenuial. 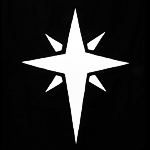 Arnor was founded at the end of the Second Age (II 3320) by Elendil, whose sons Isildur and Anárion founded Gondor at the same time. The history of the two kingdoms is intertwined; both kingdoms are known as the Realms of the Dúnedain in Exile. Before the foundation of Arnor there was already a sizable Númenórean population living there, a result of the slow emigration of Númenóreans which had started under Tar-Meneldur and especially Tar-Aldarion. Most of them lived in the harbour of Vinyalondë, later called Lond Daer Enedh. Before the arrival of the Dúnedain Arnor was home to Middle Men, and the early colonists soon interbred with the indigenous population. Arnor was originally favoured over the more southern regions because the Elves under Gil-galad lived in nearby Lindon. But in later days, when the Númenóreans fell under Sauron's shadow, they settled more to the south in port cities such as Umbar. Thus, Elendil arrived in an area populated by people who, unlike his contemporaries in Númenor itself, were mainly still friends with the Elves, and who, unlike those in Gondor to the south, retained knowledge of the Elder Days. In the war of the Last Alliance, Arnor lost much of its manpower and the army of Arnor came home a ghost of its former self. Arnor's second king, Isildur (also the King of Gondor, where he had ruled jointly with his brother), was killed in III 2 by Orcs, in the Disaster of the Gladden Fields. His three eldest sons, among them Elendur, who could have been the most magnificent ruler of the Dúnedain in exile, were killed with him. Only his youngest son, Valandil, survived; having been a child at the start of the war, he had remained behind in Rivendell. In III 10, after several years of interregnum, Valandil thus became the third king of Arnor. For several centuries, Arnor's rulers styled themselves High King, following the precedent of Elendil, who ruled Arnor directly while holding suzerainty over Gondor; the rulers of Gondor, by contrast, were merely styled King. Nevertheless, Valandil and his successors never made any serious attempt to assert their overlordship; after the death of Isildur, the two realms developed as equal and independent states. With the victory of the War of the Last Alliance, Arnor's power was apparently at its zenith. But in reality Arnor's strength had been severely depleted by the war and the Disaster of the Gladden Fields, and the northern Dúnedain never really recovered from their losses. The first few centuries of the Third Age were relatively uneventful, but it seems that Arnor's population gradually began to dwindle even in this early period. After the death of its tenth king, Eärendur, in III 861, Arnor was shaken by civil war between his three sons. The eldest son, Amlaith, claimed Kingship over all Arnor but was reduced to only ruling the region of Arthedain as his kingdom, while the other sons founded the kingdoms of Cardolan and Rhudaur. The former capital, Annúminas, became depopulated and fell into ruin. This division hastened the decline of the Northern Dúnedain. The three kingdoms had frequent border skirmishes over boundary disputes, but the relationship of Arthedain and Cardolan remained relatively peaceful. 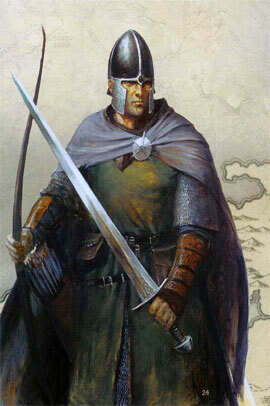 Rhudaur, by contrast, was unfriendly towards the two other successor states, and fought a bitter conflict with Cardolan over the tower of Amon Sûl and its palantír.